Author(s): Xingfeng Li, Chaoqin Gan, Key Laboratory of Specialty Fiber Optics and Optical Access Networks, School of Communication and Information Engineering, Shanghai University, Shanghai, China	Wei Li, Chenwei Wu. Background: As it is known that the access network is very sensitive to the cost, and the number of remote nodes (RNs) is large in metro-access network. RN cost occupies the main part of the whole network cost. Objective: Therefore, reducing the cost of RN is the key to improve the cost efficiency of the whole network. 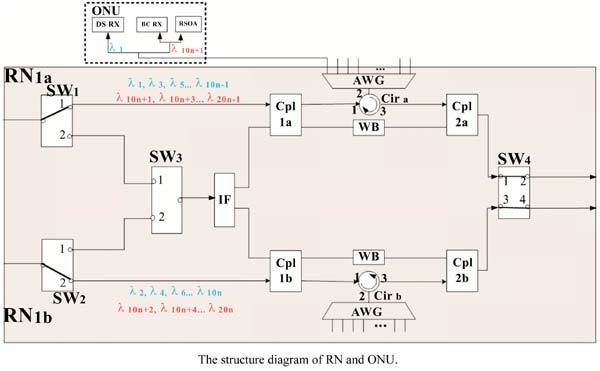 Method: In this paper, we only use some conventional optical components, such as optical switches, circulators and couplers, to design a simple low-cost structure of remote node (RN) for large-scale metro- access network based on dual-fiber ring. Results: By adopting symmetrical structure of RN in this design, the network cannot only carry out mutual protections between dual fibers, but also further decreases its operation and maintenance costs. In addition, the RN based on the structure has also the function of broadcasting services. Conclusion: Finally, feasibility of the structure has been demonstrated by simulation and analysis. Keywords: Broadcasting services, dual-fiber ring, high reliability, large-scale access network, low-cost, remote node, wavelength division multiplexing. Keywords:Broadcasting services, dual-fiber ring, high reliability, large-scale access network, low-cost, remote node, wavelength division multiplexing. Abstract:Background: As it is known that the access network is very sensitive to the cost, and the number of remote nodes (RNs) is large in metro-access network. RN cost occupies the main part of the whole network cost.